>OMG!! How much do I love felting! I am in the middle of creating a new felted project for my column in Crochet World, and I can’t tell you how much fun felting can be! I don’t know what it is about throwing a crocheted piece into the washing machine and watching it transform into something totally different. I love it! When I got done with the bottom of my piece, it was so large, I thought it could not possibly come out right. But, true to the art of felting, it shrunk almost perfectly! I did decide I wanted to make the crochet piece just a bit smaller, so I am going to make it over, but that is what the trial and error of designing is all about. 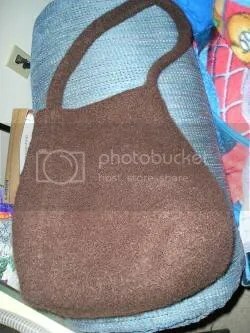 My first published felted project was the Golden Fleece Handbag in the Crochet World February 2006 issue. Here is an example of one reader’s handbag. Didn’t Cindy’s purse turn out nice? 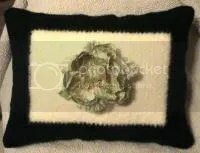 felted pillow that is very simple to make. It would be a great project to start with, if you have never tried felting before. Well, there goes my timer, I’ve gotta run! I have to check the progress on my latest felted project! Try felting, maybe you will love it as much as I do~! OMG!! How much do I love felting! I am in the middle of creating a new felted project for my column in Crochet World, and I can’t tell you how much fun felting can be! I don’t know what it is about throwing a crocheted piece into the washing machine and watching it transform into something totally different. I love it!